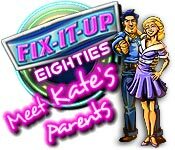 Fix-It-Up Eighties: Meet Kate's Parents is rated 3.8 out of 5 by 13. 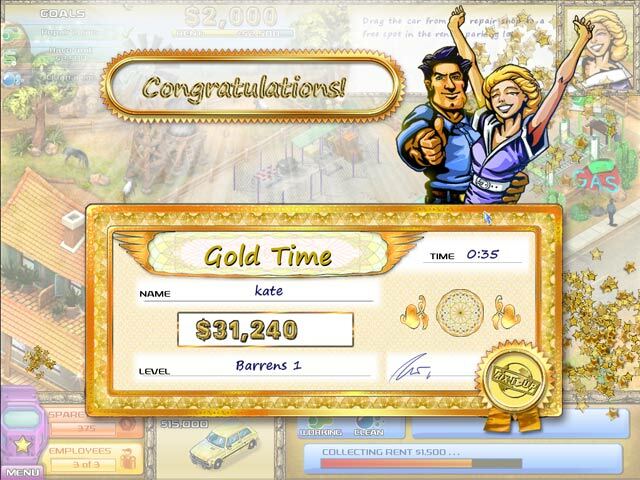 Rated 5 out of 5 by Cheri_BDG from Time goes so fast playing this! I quickly burned up my hour trial, and wanted more! I'm not generally a time management fan and am definitely not a car fan, but buying, fixing up, and selling/renting these cars out was too much fun! Kate's parents are a cute couple, and the likeable characters kept me wanting to help them succeed. The music fit the game well and was easily lost in the background as I played, often too eager to buy and sell more cars I'd lose track of my actual goals and miss best times that way! I actually spent some time doing free play without story goals, just because I love buying and selling those cars. This is definitely on my buy list! Rated 5 out of 5 by Jem_Jerrica_Guy from 80's style Music, looks, EVERYTHING! For this new millennium, this game is a MUST for those that love 80's. I only wish this were Collector's Edition to get the soundtrack, but you can replay levels just to hear it. Rated 5 out of 5 by Marcum from fix it up fun The fix-it-up games are alot of fun with a simple story line that doesnt drag you through screen after screen. Give this one a try, you will find yourself downloading and buying the other ones as well. Rated 5 out of 5 by RT2000 from game you can play for hours! I'm not a time management player (I prefer good old adventure games) but I played previous Fix-It-Up once and decided to give this part a try too. It sucked me in and I didn't even notice when I spent much more time then intended on selling and buying cars :) Excellent way to relax after a day of work. It is challenging but in a pleasant way. You just play along using your mind just enough to still relax. Rated 4 out of 5 by emsfox from Time management relaxing after a day at work. good fun to unwind. Rated 4 out of 5 by rendur from More Fix-It-Up Fun I thought this game was a very well thought out & planned sequel. I would have liked more levels if all gold for a certain chapter was achieved as in the original, but the ability to earn more pts to fix up the cafe/bar was nice. The object is basically the same as the original: Buy low & sell high. The more you upgrade your garages & cars, the better the price you can get for a vehicle. I like TM & stratagy games. This was a buy for me. Thanks BF. 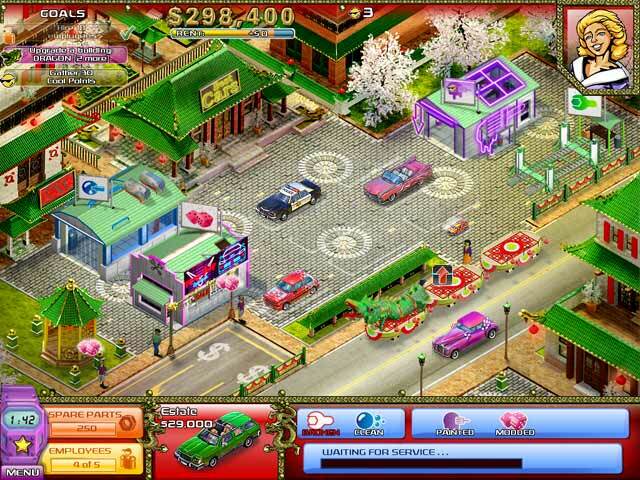 Rated 3 out of 5 by mrm2006 from Fix 'Em, Paint 'Em, Mod 'Em, and then Run a Taxi Service! Okay, I didn't cry "uncle" in the previous version of the game but this one had me crying "uncle" after 30 minutes - lol. Again, while the tutorial is extremely helpful in this version of Fix-It-Up, there is just sooooo much going on at one time. Buy broken down cars from the street in front of your shop. Make sure you have enough spare parts to repair them - paint them - construct a "mod" shop and turn them into convertibles. But, do you rent them or sell them? Don't forget to hire employees! And before the demo was half over - someone is offering you a taxi service to run ----- UNCLE!!!!! 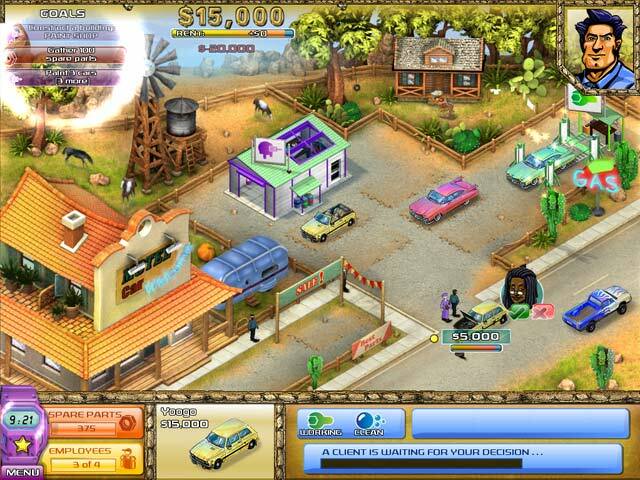 This game is still for the car enthusiast, mechanic, car salesman or anyone who is brave enough to try the car business. Somehow I completed levels and even leveled up - but beats me how - lol. I birthed a son to work on my car. LOL. Still and all - it's me not the game - so please do try the hour-long FREE demo. You just might have a new career up your sleeve...want to sell me a car? Happy Gaming! Rated 3 out of 5 by Barxx from Way too short I love all the Fix-it-Up games, and I enjoyed this one just as the predecessors. My only complaint is about the duration: I completed the entire game in a few hours. They need to add more levels!